Do you believe that the way to achieve better performance is to be a servant to your people and your organisation? If you do, then this workshop is for you. During the day you will develop your awareness, skills and beliefs to become a better agile coach or ‘Scrum Master’ or a better team player. You will do this for your team, your organisation but also for yourself. This workshop is uniquely designed to develop participant’s coaching skills in Active Listening, Powerful Questioning, Goal Setting and Developing Trust. It makes use of the Agile Coaching Competency Framework (Agile Coaching Institute) and incorporates Coaching Constellations Concepts by creating a living dynamic map that participants can use to explore and create their perception of their own capability in this field. Participants will not only learn more about themselves but also experience coaching, use a competency model to gain feedback and identify options to take forward. By exploring these principles together in this workshop, learning will emerge from within each of us and action will arise in the practice you apply back in your workplace. Jon Sleeper is a Professional and Agile Coach with more than 25 years’ experience, creating, evolving and delivering new technology products. Jon has a particular appetite for the power of professional coaching to achieve successful outcomes. He enjoys working with orgs that want to change by embedding lean and agile ways of working to enable more productive teams and a more purposeful working environment. Jon offers performance coaching to help leaders and team members to create an environment that is inspiring and motivating. Lean/Agile hands-on practitioner since the beginning of the agile movement. 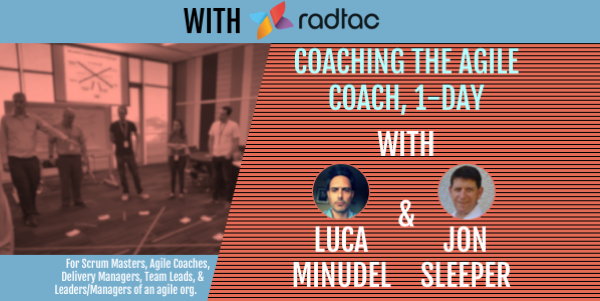 Luca Minudel is a qualified agile coach and has many years of hands-on experience as lean-agile coach. He delivered coaching and training in top-tier organisations in Europe and the United States for ThoughtWorks. He has 15 years of hands-on experience with a variety of lean/agile frameworks, in a variety of teams, industries, and organisations, including Scuderia Ferrari F1 racing team. He embarked on a multi-year journey of personal discovery and development, that led him to develop many of the traits that make him a good coach. For leaders, team members, scrum masters, agile coaches, or anyone else who wants to develop themselves or their organisation to be self-managing and high-performing. Participants should familiarise themselves with the agile manifesto. This course is organised in partnership with Radtac. Concession tickets and large-group discounts are also available. Contact us for private, in-house, training.